Unlike many Mynah birds, Java Hill Mynahs do not walk or waddle but move in a series of short hops! Hill Mynahs are most vocal in the evening, when they call to each other with a variety of sounds. In captivity, they are known for such vocalizations and are able to mimic speech with incredible skill. In the wild, Java Hill Mynahs usually travel in pairs although flocks containing about 100 birds are not unknown. They eat soft foods like fruits, especially berries, figs, flower nectar, small lizards, insects and occasionally small mammals. Java Hill Mynahs have louder voices than most other Mynahs. 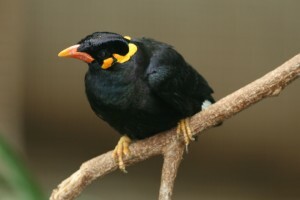 In captivity, the Java Hill Mynah will need fresh water at all times. They love to bathe, and should be allowed a bath at least twice a day. After they bathe, they will shake off their feathers and sneeze. They will preen their feathers after baths and after being handled. Java Hill Mynahs should be fed a good pelleted diet supplemented with plenty of fresh fruits and vegetables. Although they are best kept in aviaries, Java Hill Mynahs will also do well in small cages so long as they have plenty of time out to exercise. They need a solid night of sleep although they will also nap during the day. Inside such a cage, your Java Hill Mynah will need at least two perches and some will like a small cardboard box to sleep in. These birds are quite affectionate and love attention. Although they like to perch on shoulders and take an interest in the human friends’ activities, they generally do not particularly like to be petted. The best talkers are those Java Hill Mynahs who have been raised around humans from a very young age. Although these birds will do well when kept in pairs, it is best not to keep them in groups, lest they become jealous of each other or territorial. Java Hill Mynahs are intelligent animals, and will need lots of toys in their cages in order to keep them amused. They can be taught tricks as well as words and sounds! They usually live about 20 years. 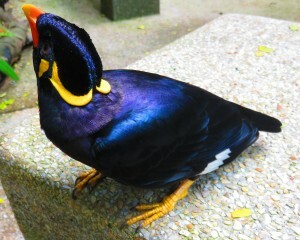 Covered in black feathering, which has iridescent purple, turquoise or green sheens in sunlight, the Java Hill Mynah is less plain than it might appear at first glance. The bills of Java Hill Mynahs are a cheerful orange color. They end in a yellow tip, and the feet and legs are also yellow colored. There is a lovely white stripe across each wing, accenting the bird’s glossy black appearance. 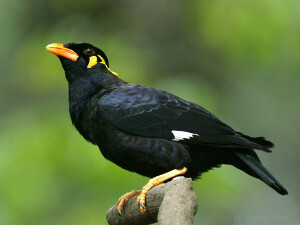 Most Hill Mynahs have yellow wattles. They grow to a length of about 12 inches. Usually Java Hill Mynahs live in altitudes of 1,000 to 5,000 feet above sea level. They prefer damp forests and sometimes are found in coffee or tea plantations. Usually, Java Hill Mynahs are found across Bali, Borneo, Malaysia, Sumatra, Java, and Bangka Island. 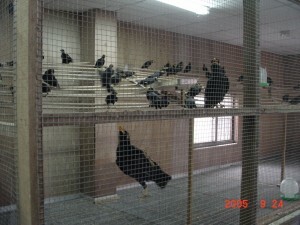 They are exported for the pet trade and are also known as Talking Mynahs. They are endangered in the wild. Java Hill Mynahs are susceptible to aspergillosis, which is carried in spores of food or litter. Symptoms of this disease include increased thirst, gasping, anorexia, sleepiness, dyspnea, diarrhea and weight loss. They also do not do well when they have too much iron in their diets; it can lead to illness and even death in Java Hill Mynahs. In the wild, Java Hill Mynahs usually mate in spring or summer, and will collect twigs and foliage with which to build nests. In captivity, male Java Hill Mynahs will weave a nest for their mates when provided with straw! They will line the nest with shredded paper and when the nest is ready, the female will lay a clutch of about two or three days. The eggs are blue and speckled. Both parents will incubate the eggs until they hatch in about two weeks. Usually, the parents are very good about allowing their keepers to handle the baby birds. They may be left with the parents for about two weeks before they are removed and hand fed. When baby Java Hill Mynahs beg, feed them. When they stop begging, stop feeding to avoid over feeding them. They may be started on the same foods they will eat when they are fully mature, although people usually start them on mealworms, cooked potatoes, cooked vegetables or oatmeal. Usually, baby Java Hill Mynahs will fledge after 25 and 28 days. Immature Java Hill Mynahs have ragged or sooty looking plumage, and do not have fully developed wattles yet.